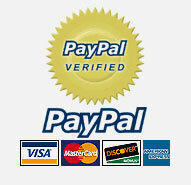 To buy with PayPal click on button "Buy Now". To buy with MoneyBookers or Debit/Credit card click on animated button "Moneybookers". If you are not registered on our website please click here to register now ! SKRILL (old: Moneybookers) is developed with the same demands on security and performance as the sites used for bank services and share trading. Your account login, personal details and all money transactions are secured using Secure Socket Layer (SSL) technology with high security 128bit encryption, certified by VeriSign.